There’s nothing like a loaf of homemade bread. But if your first attempts at baking have landed you loaves that collapse in the oven, don’t get crusty and lack flavor, we wouldn’t blame you for wanting to give up and stock your pantry with loaves from the grocery store as usual. Don’t give up yet, though. Baking bread at home is an art and a science, but it’s not magic. 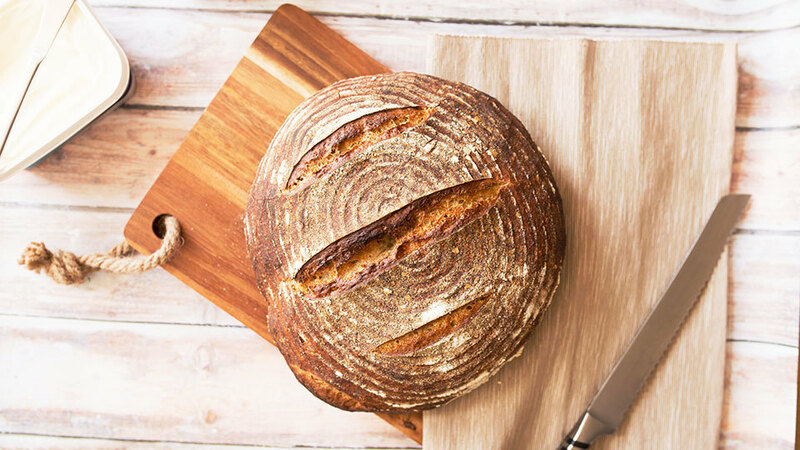 We asked a bread-making expert for tips on how to make the perfect loaf at home, and it’s really no harder than confronting your yeast-based fears head-on. “Don’t be afraid, just do it. If it doesn’t work, it’s not the end of the world. You can try again,” Chef Sim Cass, dean of bread baking at the Institute of Culinary Education, told SheKnows. Quick breads are tasty, but the true Holy Grail in bread-making lies in yeast doughs. Yeast can be kind of tricky, but handling it doesn’t have to be. It’s important that you knead your dough long enough to properly develop the gluten — otherwise, you’re bread won’t rise correctly. Think of it as a mini-workout. Five to 10 minutes should do it — when you’ve kneaded long enough, the dough should be smooth and elastic and pass the windowpane test. “The biggest challenge is impatience. You just have to go slowly and give the yeast time to work,” Cass said. And in your haste to move the yeast along? “Don’t let the dough get too warm!” This can cause the bread to over-rise and overproof, leaving you with a loaf that collapses and flattens in the oven. You might be anxious to eat bread within hours of starting your dough (I feel you! ), but you might want to consider resting your dough overnight in the fridge. This cold ferment allows deeper flavors to develop, and the chilled dough is easier to shape into a loaf the next day too. It’s the method favored by the popular Artisan Bread in Five Minutes a Day. Commercial bread-baking ovens use convection heating to ensure that hot air surrounds each loaf of bread, allowing it too cook evenly. Many professional bakers also have steam injected into their ovens, which allows the loaves to rise properly before a crust forms. To mimic these conditions in a home oven, you can do a couple of things. “The best thing you can do is mist the bread with water from a spray bottle before putting it in the oven — get the surface of the bread wet,” recommends Cass. Another trick? Bake your bread in a Dutch oven that’s been preheated in a 450 degree F oven. Spritz your bread with water, then put the cover on the Dutch oven and bake for 30 minutes. This will help the bread rise properly. Then, remove the cover, and continue baking until done, about 15 more minutes, or until a thermometer inserted into the bottom of the loaf registers 190 degrees F.
Bread requires very few ingredients, and they’re inexpensive to boot. Most standard recipes include flour, water, yeast and salt, and sometimes a little sugar or oil. If your first loaf doesn’t come out quite right, you can always try again. Now that you have these tips, you can make professional-style bread at home. All it takes is flour, water, yeast and time.